Haiti is caught in a "deep political, social and economic crisis", says a new report by Brussels-based think tank International Crisis Group (ICG). The security situation is "explosive" despite the presence of a 7,400 UN peacekeeping force, it says. It blames warring gangs - supporters or opponents of ousted President Jean Bertrand Aristide - for the bloodshed. Several people have been killed in fresh outbreaks of violence as the UN voted to extend its mandate by 24 days. The reports says "powerful spoilers" are fomenting the violence and instability "out of a desire to seek, keep or maximise power, income, authority, or position". It says that political factions, elements of the business elite, drug-traffickers and other criminal organisations have a "clear interest in delaying the elections and in destabilisation". The continuing violence threatens to overshadow the country's local, legislative and presidential elections, due between October and December. At least three people were killed during unrest on Tuesday, including the French honorary consul in the northern city of Cap Haitien, who was shot dead as he was driving near the capital, Port-au-Prince. Human rights groups say more than 600 people have been killed in violence in the Caribbean island since last October. 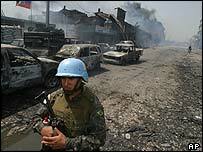 The ICG says the UN needs to take control of law enforcement and security forces if the situation is to improve. The human rights situation, says the report, is still alarming with allegations of summary executions, violence against women and kidnappings by the Haitian police force. "Underlying much of the violence is the chronic failure to tackle poverty, social deprivation and exclusion that endanger most of the population," says the ICG report.